Up 27-13, the Eagles stopped Green Bay on a 4th-and-4 from the PHI 7-yard line - a huge stop, keeping it a two-score game. But, with a full 9:32 remaining in the 4th quarter, the Packers still had plenty of time to get back in it... or so they thought. The Eagles took over on downs, deep in their own territory. What followed was a masterfully orchestrated, 16-play, 70-yard drive that drained the entire contents of the game clock. 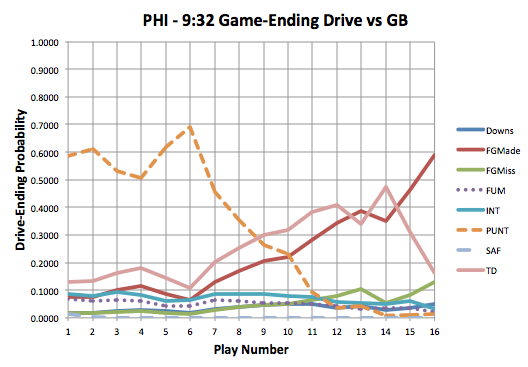 The Eagles wracked up six first downs on the drive, only throwing the ball one time. The drive looks funny in the play-by-play as every play is listed as some combination of shotgun and no-huddle, despite the Birds running the play clock into the ground. Far and away the biggest play of the drive was play 6. After committing a false start penalty on 3rd-and-manageable-2, Foles and the Eagles punt probability was at 69.0%. Chip Kelly called the only pass play of the drive, as Foles completed a short pass to tight end James Casey for 8-yards, converting and dropping the punt probability to 45.5%. Two big run plays by LeSean McCoy and one by Bryce Brown and that punt probability was under 10%. Green Bay, realizing how much time had just been nursed off the clock, used their final timeout before Nick Foles scrambled for nine yards on 2nd-and-9 to seal the game. The drive-ending probabilities toward the end of the drive will not be as accurate, since time is not taken into consideration in the Markov model, but the early punt probabilities certainly are. This drive is particularly notable because Chip Kelly took severe criticism following the Eagles' Week 2 loss to the Chargers for poor clock management at the end of the game. Kelly and his high-speed offense drove down the field too quickly and kicked the game-tying field goal with too much time remaining on the clock, which ultimately led to a loss. I'll admit as a Packers fan that even if Rodgers is QB the last two weeks, the defense got run over when it counted the most. However, two of the TDs that Foles had - one TD was caught when two defenders decided to hug it out instead of tackling the WR; the other was underthrown yet the defenders thought it might just drop and just stared it (or the sun). Obviously they still could have scored, but the product of the 9+ min drive was due to the defense, not because Philly is such an awesome team. As I say that though, they'll probably win their division by default. I think they're more big-play than given credit for.